"Clearstone makes the process so easy. They make sure the risk assessment happens and they talk to the client to explain the installation process. Clearstone craftsmen are very professional." Nigel Clark, Contract Manager for Martin Joyce Ltd.
Colour used: Birch – Woodcote School. Colour used: Bronze Trio – White Gates. Meeting tight deadlines and adhering to environmental and Health and Safety regulations are crucial for groundworks contractors Martin Joyce. 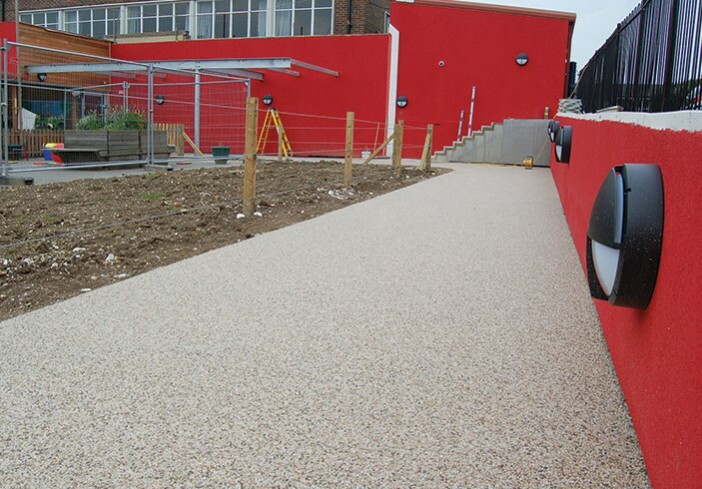 They needed a reliable company to take responsibility for both the quality of the finished resin bound paving and the process. 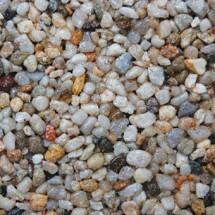 ‘Clearstone Paving Limited makes the process so easy. They make sure the risk assessment happens and they talk to the client to explain the installation process. Clearstone craftsmen are very professional,’ says Martin Joyce Contracts Manager Nigel Clark. 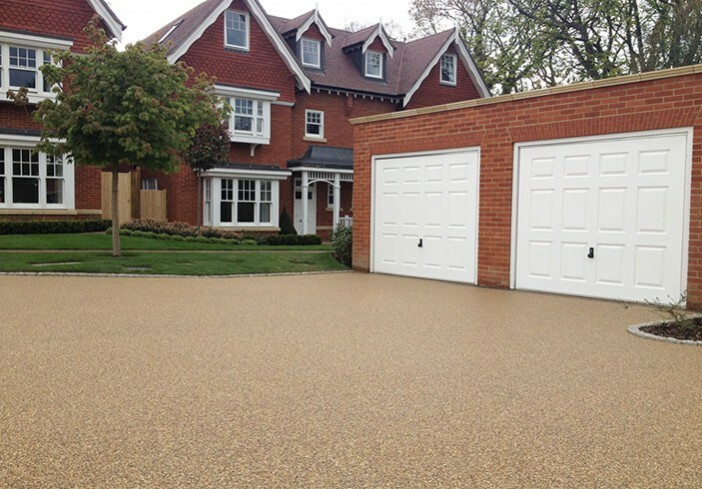 With Constructionline and SSIP accreditation, Clearstone craftsmen ensure the installation of Clearstone resin bound is as smooth as the surface itself. 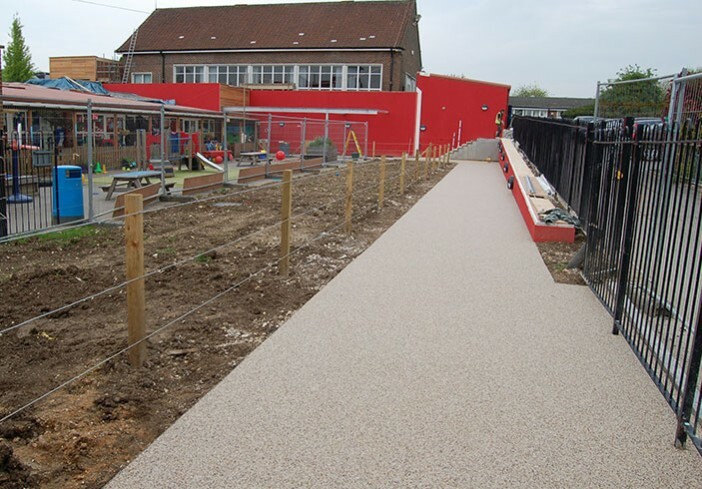 ‘At Woodcote School in Coulsdon there were difficult time constraints to install pathways for the start of term but Clearstone met the deadlines,’ says Nigel. Clearstone installed 273m2 of natural Birch aggregate in under three days to ensure a flying start for the children at Woodcote School. 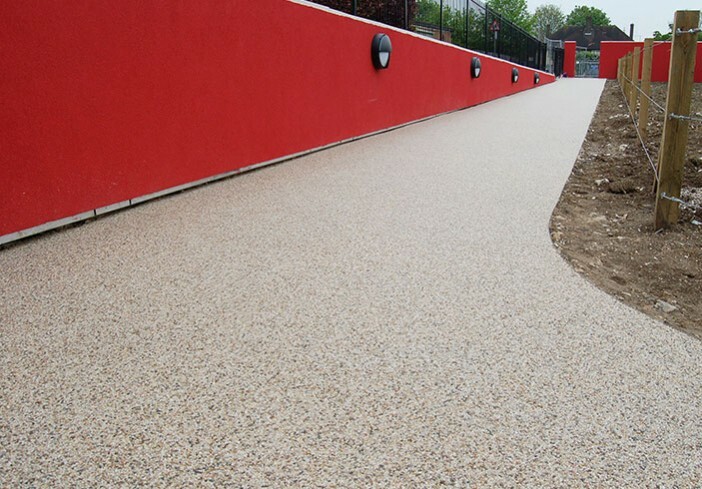 Due to its sustainable credentials, sleek good looks and ability to create sharp angles and lush curves, resin bound is often specified on drawings for projects ranging from new build housing to schools. Its porosity means no standing water, SUDS compliancy and accessibility to a wide community: it is buggy, vehicle, pedestrian and wheelchair friendly. 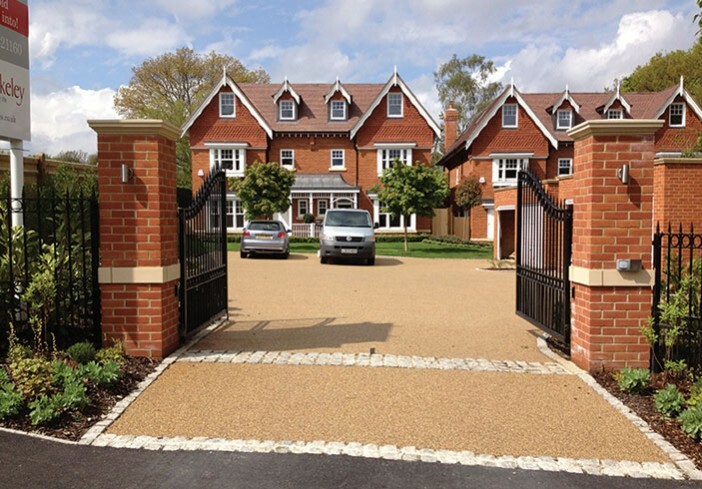 Which is why Martin Joyce keep choosing Clearstone resin bound in a range of settings such as White Gates, Esher – a prestigious Berkeley Homes development of 4-bedroomed executive Edwardian style homes. Here 253m2 of resin bound in Bronze Trio enhanced these elegant state-of-the art residences whilst providing practical paving and driveways for all users. 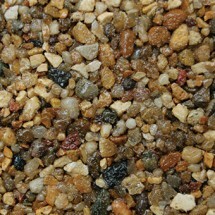 Clearstone mix only the highest quality UV-stable resins and special blend of aggregates colours, formulating their own products to offer a truly bespoke service. With a background in landscape design and building, Clearstone craftsmen are able to design and install motifs, decorative effects, logos, numbers and letters. And Clearstone experts control the whole process so clients are assured of quality workmanship and service backed by a 10-year guarantee. From quirky to traditional, ultra modern to heritage in residential, public or commercial settings, Clearstone resin bound is the perfect paving installed by a company with a reputation for quality and reliability. ‘We hit it off with Clearstone: it’s a good company to work with; they give us what we want!’ says Nigel Clark. Martin Joyce Limited knows that Clearstone professionals work alongside the many contractors on site so that everyone gets their work completed safely and without hassle. ‘You know you’re doing something right if the client doesn’t even notice you’re there until the job’s done!’ says Clearstone Operations Director Spencer Kennard. 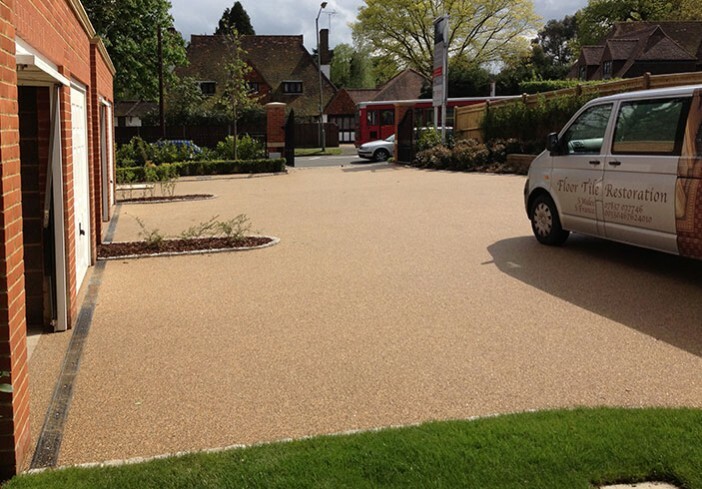 ‘We used Clearstone for our first resin bound installation and if it ain’t broke, don’t fix it! I would definitely recommend Clearstone to other contractors,’ says Nigel Clark, Martin Joyce Contracts Manager. Project: Woodcote School, Coulsdon and White Gates, Esher. Edging: Aluminium Edging for the school. Area: Installed area 273 m2, for Woodcote School, Coulsdon laid at a thickness of 18mm. Area: Installed area 253 m2, for White Gates, Esher, laid at a thickness of 18mm.